I came to St Mary towards the end of a smoky, crisp day in late autumn, and the weather suited it perfectly. Woodbridge is a town I know well - it is less than eight miles from my house, and I often cycle here on a Saturday. But it had been some years since I had last visited the church. I came here with fellow East Anglian church explorer David Striker. We'd spent the day pottering about on the Bawdsey Peninsula. David is a rather unusual member of the breed, because he lives in Colorado in the USA, but he was pleased to come to Woodbridge because it was where his mother was born. Externally, this is one of the great English churches. Its setting is superb, wholly urban, and yet conscious of its presence in an ancient space. The narrow churchyard climbs away from it, surrounded on two sides by 18th and 19th century houses. To the north is the Market Square, and a stairway leads down from it to the great porch. The whole thing is just about perfect; the relationship between town and church expressed exactly. The tower is one of Suffolk's biggest, bold and dramatic in the landscape, particularly when seen from the quayside. Close up, it is even moreso, because it rises from below the level of the graveyard, sheer up for more than a hundred feet, a stark, clinical job of the late 15th Century. 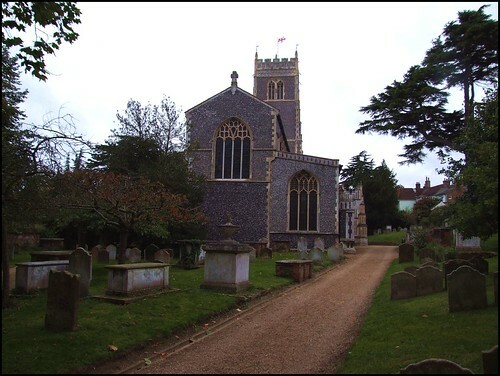 St Mary has much in common with Southwold St Edmund, being only slightly smaller, and built all in one go over a similar period and timescale. However, the tower of St Edmund is a riot of flushwork, and here the flint is sparer, cleaner, more precise. This only serves to accentuate the splendour of the great north porch through which you enter the church, past the dole cupboard of John Sayer, 1638. This bequest provided bread for the poor of the Parish, and was still in operation up to the middle years of the 20th Century. Through the great doors is a fine, grand Victorian interior, the work of Richard Phipson. It is reminiscent of his rebuilding of Ipswich St Mary le Tower, although the nave here is not encumbered by that church's unfortunate heavy glass. Here, you find yourself in a wide, light space, a seemly setting for a number of fascinating medieval survivals. The greatest of these is St Mary's Seven Sacrament font, one of thirteen survivals in Suffolk. The panels show the sacraments of the Catholic Church, and are a reminder that our Medieval churches were not built for congregational Anglican worship. The panels are a bit battered, but are all recognisable. Despite Cautley's doubts about the rayed backgrounds, it seems likely that it was a product of the same workshop as the fonts at Denston and Great Glemham. The butterfly head dresses of the women date it to the 1480s, making it contemporary with the other two. The panels are, in clockwise order from the north, Ordination, Matrimony (the two sacraments of service), Baptism, Confirmation (the two sacraments of commission), Reconciliation, Mass, Last Rites (along with Reconciliation, one of the two sacraments of healing) and, in the final eighth panel, the Crucifixion. This last panel, anathema to the protestants of the 1540s, has been particularly vandalised. The survival of so much Catholic imagery, when we know that the 17th century puritans were particularly active in this area, may seem surprising. But, ironically enough, it is a result of the destruction of a century earlier.During the early Reformation of the 1540s, Woodbridge was wholeheartedly Anglican, and the wrecking crew went to work with a vengeance. The destruction here probably took place in the Autumn of 1547, during the first months of Edward VI's reign, when there was a bit of a free-for-all in places like Suffolk. The easiest way to deal with the font was to knock off the more prominent relief, and plaster the whole thing over. When Dowsing and his Biblical fundamentalists arrived at this church almost a century later on the 27th January 1644, they found very little to do. The Anglicans had also destroyed the roodscreen; in 1631, 13 years before the visit of William Dowsing, the antiquarian Weever lamented the fact that how glorious it was when it was all standing can be discerned by what remaineth, showing that its destruction had occured before the Puritans were ever on the scene, despite decrees of the time that this should not happen. What survives is two ranges of ten panels, about a third of the original number, which have been placed in recent years on the west and south walls by the font. They are splendid, although their protective glass makes photographing them rather awkward. Part of the donor's description survives, but nothing above the dado rail. The modern screen has been recently curtailed, and the surviving panels are in the aisles. They are actually pretty good, including attempted replicas of some of the medieval panels, the figures a bit like the same artist's work in the sanctuary at St Mary le Tower. Otherwise, there's a grand memorial of the 1620s to Geoffrey Pitman in the south aisle, climbing to heaven in tiers that seem rather extravagant for a town weaver and tanner, but a weaver in Suffolk might be the equivalent of a factory owner elsewhere. two hundred years previously, another Woodbridge weaver had donated the screen. There is a single surviving brass attached to the chancel arch, a decent pulpit and some hatchments, all you'd expect from a town church. But one of the glories of this place is even more modern. This is the gorgeous memorial glass in the east window by Martin Travers. It shows the adoration of the Magi, and was installed shortly after World War II. There is a very similar window by Travers at the remote Broads church of Thurne in Norfolk. I remember visiting this church back in May 2001, the first truly glorious spring day of that year. It was the day before my 40th birthday, and if I am honest then I must admit that I was feeling a bit down. But the experience of this place uplifted me. Phipson's excellent work in a perfect 15th century coating, one of Suffolk's best fonts, and a sense of duty being fulfilled by those who care for it all. This church always seems to be open and welcoming, and reflects Woodbridge's pride in itself as a proper town, despite its size. A proud church in a proud little town. And this is a church so visitor-friendly that it even has cycle parking in its fascinating graveyard. This is a national treasure- the graveyard, not the cycle rack - and is a gorgeous verdant cushion for its large jewel. To the north-west of the church is a table tomb with skull, bones and last trump carved in relief on its side - I don't think that I've seen the like anywhere else in East Anglia. I walked up to the top of the bank, bringing me level with the statues in the porch alcoves. I looked across at the stunningly pretty houses that open out into the graveyard. Quite what you have to do to deserve to live in one, I'm not sure. But I resolved immediately to start doing the National Lottery, just in case. For David, this was the last church of a fortnight's trawl through the eastern counties. He was catching his flight back to Denver in the morning. I said goodbye to him on the market place, and cycled down towards the Quay. The damp chill began to creep up from the Deben and into the bones of the town as I headed my bike for home, the beam of my front light carving out a ghostly tunnel in the fading dusk.